LAGUNA BEACH, Calif. (AP) — Ocean wildlife experts are urging boaters in Southern California to keep an eye out for a juvenile gray whale tangled in a fish net. PORTLAND, Maine (AP) — A proposal to let dozens of new lobstermen into Maine's signature fishery is going to be put off until at least 2020. SAN FRANCISCO (AP) — Marine experts say two dead gray whales were found in the San Francisco Bay this week and that one of them died from severe malnutrition. A Congressional panel is holding a hearing about the threats facing endangered North Atlantic right whales, which number only about 411. KODIAK, Alaska (AP) — Seven dead whales washed ashore on Kodiak Island in 2018, according to officials with the National Oceanic and Atmospheric Administration. DAYTONA BEACH, Fla. (AP) — Seven rare right whale calves have been spotted so far this winter off Florida's Atlantic coast. Researchers say each new calf spotted this year is an encouraging sign for the critically endangered whales. No newborns were spotted during the last calving season, and just five calves were counted during the previous year. The Canadian government is offering new measures to try to protect endangered whales in the wake of the announcement of a similar effort by American fisheries managers. Fisheries and Oceans Canada says its measures are designed to cut down on ship strikes and entanglements in fishing gear that threaten the North Atlantic right whale. MOSCOW (AP) — Activists are expressing alarm about more than 100 whales that are being kept in small, crowded pools in what environmentalists are calling a "whale prison," off the coast of the Russian Far East. PASADENA, Calif. (AP) — Origin stories aren't just for comic-book superheroes, as a documentary about the evolution of animals including elephants and whales intends to show. MIAMI (AP) — A rare whale was found dead in the waters of Florida's Everglades National Park. Kekaha resident Kevin Rogers told the National Oceanic and Atmospheric Administration about the carcass after finding it during a Monday morning beach walk, The Garden Island reported . The nearly 10-foot (3-meter) whale carcass was covered in wounds, Rogers said. TOKYO (AP) — Japanese whalers discussed plans Thursday to resume their commercial hunting along the northeastern coast on July 1, for the first time in three decades. The whale is one of the rarest marine mammals. It's thought to number only 411 individuals . The animals travel through New England waters every year. KAILUA-KONA, Hawaii (AP) — An annual humpback whale count in Hawaii will take place despite the federal government shutdown. West Hawaii Today reported Friday that volunteers from the National Marine Sanctuary Foundation will coordinate this season's Ocean Count, a community citizen science project that occurs during the peak of whale season. CAROLINA BEACH, N.C. (AP) — Officials say a whale of an endangered species became stranded on a North Carolina beach and had to be euthanized. News outlets report the sei whale was discovered Sunday morning on Masonboro Island near the town of Carolina Beach. Ann Pabst with University of North Carolina Wilmington's Marine Mammal Stranding Program says it's rare a sei whale strands in North Carolina, and could only recall one other that did in the 1990s. DAYTONA BEACH, Fla. (AP) — Floridians are reporting rare sightings of humpback whales. The whale sighting hotline for the Marine Resources Council has received daily calls of humpback sightings in Flagler and Volusia counties. Both right whales and humpback whales migrate off the Florida coast. The Daytona Beach News-Journal reports that right whale sightings were at a record low last year and no right whale calves were reported along the Eastern Seaboard. JACKSONVILLE, Fla. (AP) — Florida conservationists are reporting a right whale calf sighting off the state's Atlantic coast. PORTLAND, Ore. (AP) — Migrating gray whales will once again be passing along the Oregon coast this winter, where visitors and volunteers will gather for the annual Winter Whale Watch Week. The Oregonian/OregonLive reports the five-day event is organized by the Oregon Parks and Recreation Department and will run from Dec. 27 to 31. The agency said officials haven't made a final decision but are considering the step. LEWES, Del. (AP) — The director of a marine research institute says the juvenile female humpback whale that washed ashore in Delaware was likely killed by a boat strike. Suzanne Thurman with the Marine Education, Rehabilitation and Research Institute tells news outlets blunt-force trauma was identified as the cause of death. 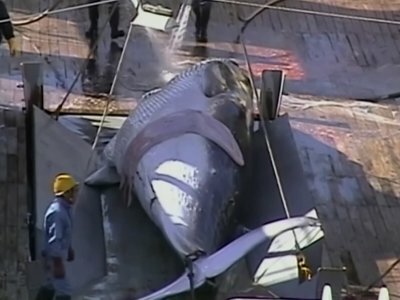 The strike dislodged and broke the whale's cervical vertebrae. PROVINCETOWN, Mass. (AP) — Marine scientists say endangered North Atlantic right whales have been spotted in Cape Cod Bay for the first time this feeding season. The Center for Coastal Studies says its aerial surveillance team saw seven right whales in the bay on Tuesday. They are among about 411 left in the world. The whales have been under close watch in recent years because of a downward population trend. The whales transit the area every year to feed on microscopic organisms. PORTLAND, Maine (AP) — Federal officials say last year was slightly worse than average for the entanglement of large whales, which is a major threat to the animals' populations. That's global warming in action. Climate change is more than heat waves, hurricanes, floods, droughts, sea level rise, melting ice and ever-increasing temperatures.